The first source on the Angolars, which were African slaves where brought from the mainland, probably from Angola who survived a shipwreck that happened about 2-3 miles (4 km.) in the south coast of São Tomé Island. 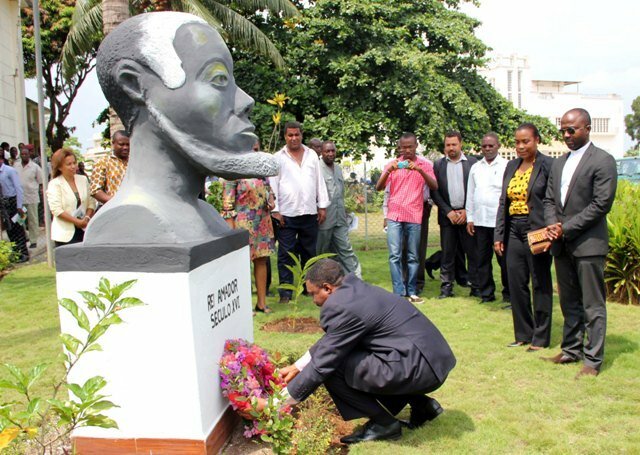 Another version was that the Angolars were African slaves who had evaded their owners around 1470, when the Portuguese discovered the islands of São Tomé and Príncipe and have created their own free nation within the islands called Kilombo or Quilombo. The name Kilombo or Quilombo derives from (Kimbundo one of the most spoken Bantu languages in Angola), it can mean a settlement kingdom, population and union. Kilombo was an independent nation made by African slaves, who fought against slavery, once they fled, build their independent state with the system of slavery, The Kilombos, in general were localized in its regions densely forested, far from the plantations. On foreground is Conobia bird or the Kingfisher. There is an interesting story about the kingfisher subspecies on this note. The fact is that, most likely, the Kingfisher Sao Tome (Corythornis cristatus thomensis), an endemic of the islands, should have been depicted on the banknote. 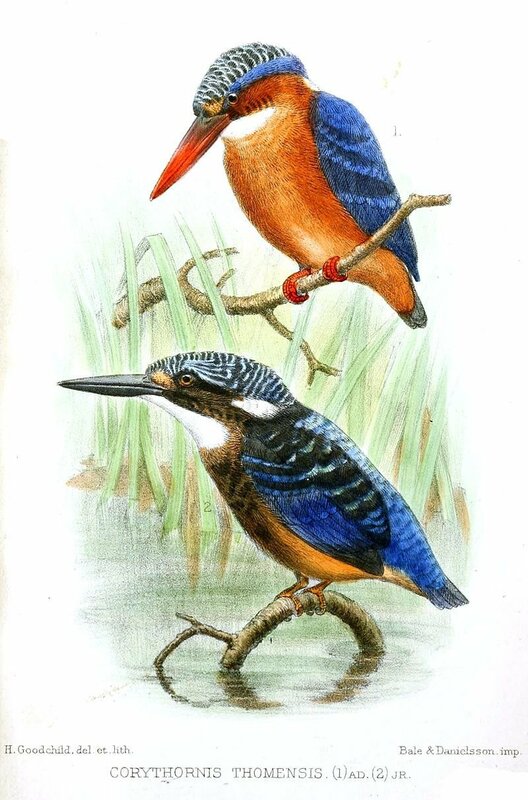 The São Tomé kingfisher (Corythornis cristatus thomensis) is a bird in the family Alcedinidae. It is endemic to São Tomé, an island off the west coast of Africa in the Gulf of Guinea and was first described by the Italian ornithologist Tommaso Salvadori in 1902 under the binomial name Corythornis thomensis. 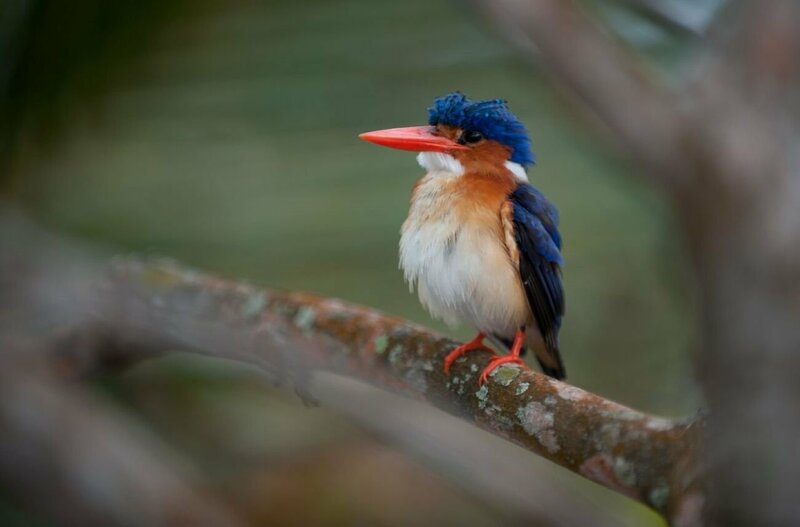 A molecular phylogenetic study published in 2008 showed that the São Tomé kingfisher is a subspecies of the malachite kingfisher. 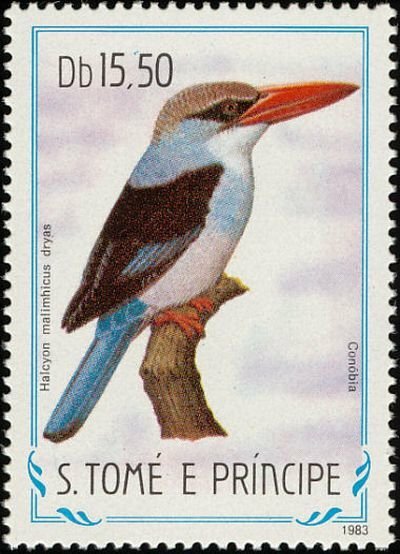 However, the image of the kingfisher on the banknote looks more like this bird from the 1983 Sao Tome stamp - the Halcyon Malimhicus subspecies, or the Halcyon senegaloides subspecies - the Mangrove Alcyone. 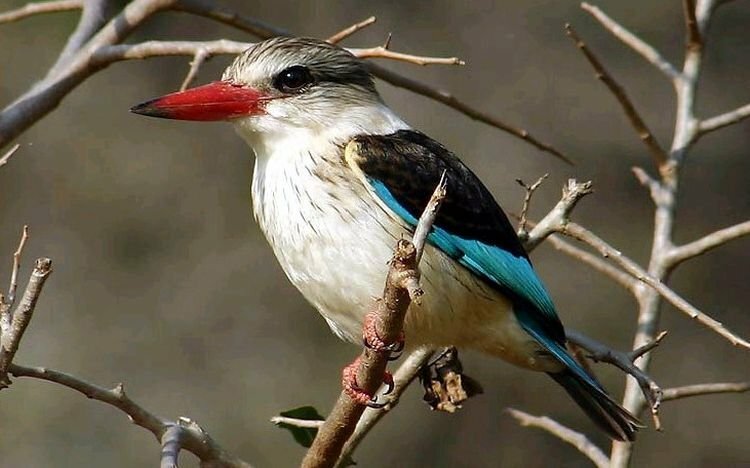 The mangrove kingfisher (Halcyon senegaloides) is a kingfisher in the genus Halcyon. 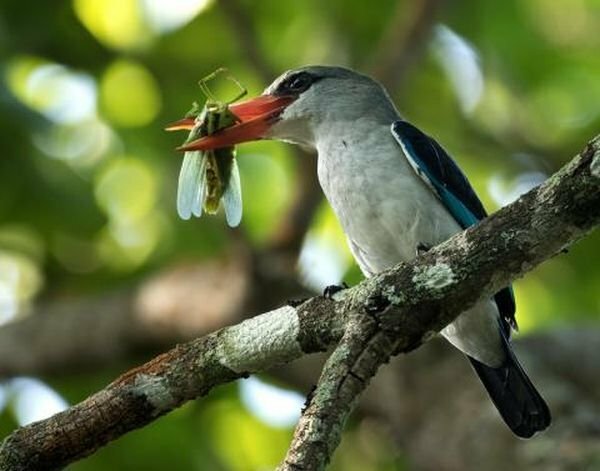 It is similar in appearance to the woodland kingfisher. It is found along the eastern coastline of Sub-Saharan Africa, living in woodland, along rivers, and in estuaries and mangrove. The International Union for Conservation of Nature (IUCN) has assessed it as being of least concern. 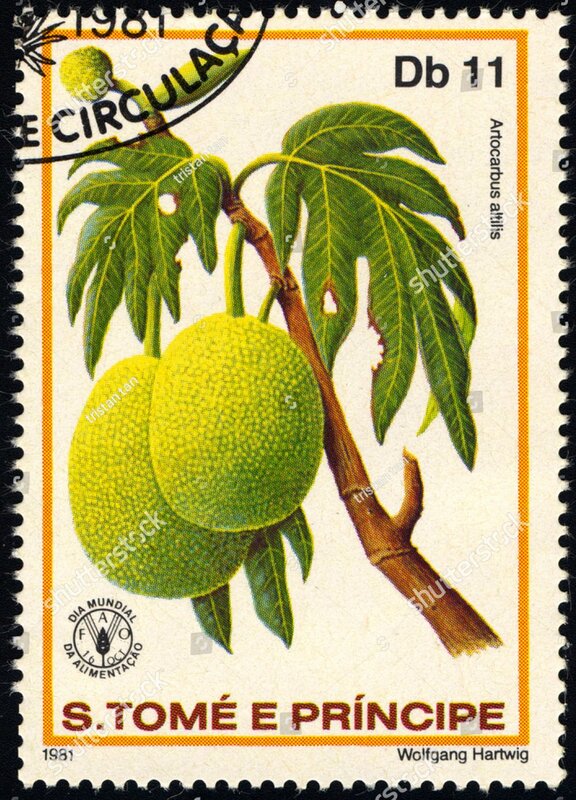 Many thanks to Olga, from the Guy city, Orenburg Region, Russia for help in finding trees on Sao Tome and Principe banknotes. There is an assumption that the background is Breadfruit (lat. Artocarpus altilis), whose fruits are very popular between kingfishers. Breadfruit is closely related to Artocarpus camansi (breadnut or seeded breadfruit) of New Guinea, the Maluku Islands, and the Philippines, Artocarpus blancoi (tipolo or antipolo) of the Philippines, and Artocarpus mariannensis (dugdug) of Micronesia, all of which are sometimes also referred to as "breadfruit". 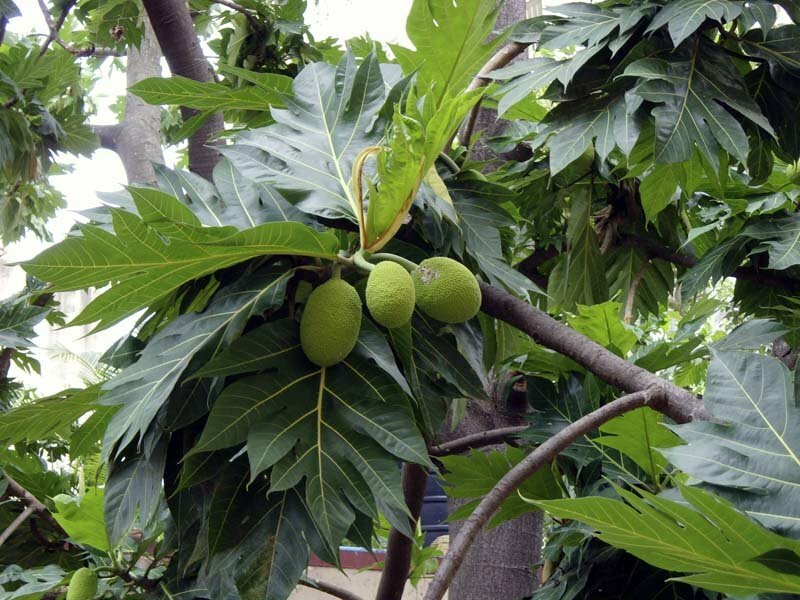 It is also closely related to Artocarpus heterophyllus (jackfruit). 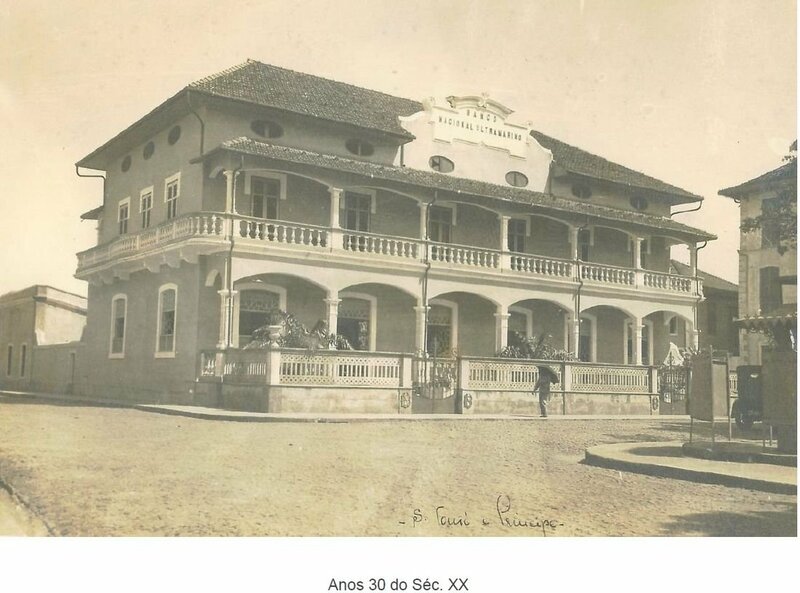 The first branch of the Portuguese National Bank Ultramarino was opened on Sao Tome, on Rua do General Calheiros, January 1, 1868. The first managers were M. Tobin and Junior Joao Pedro Mendez - they left Lisbon with the steamer "D. Anthony", on December 5, 1867, who also brought furniture and office supplies for use at the bank branch premises. The initial capital was 50,000 Rice, in metallic currency, received from a branch in Luanda, Angola. The first building had a backyard, which was connected to a kind of warehouse, where BNU was engaged in business. Only in July 1913 they were ordered to build sanitary facilities in the branch building. 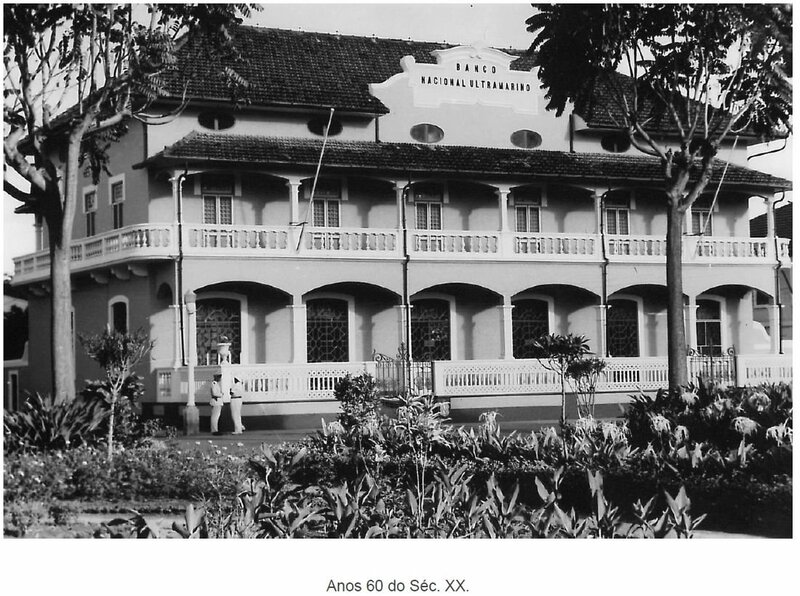 The proof of the expansion cycle and territorial approval of the bank at the beginning of the twentieth century was the opening of the BNU sub-agency in Ilha-du-Principe until 1911, which was transformed into a bank branch in 1919 to support the intensification of the island’s agricultural development. 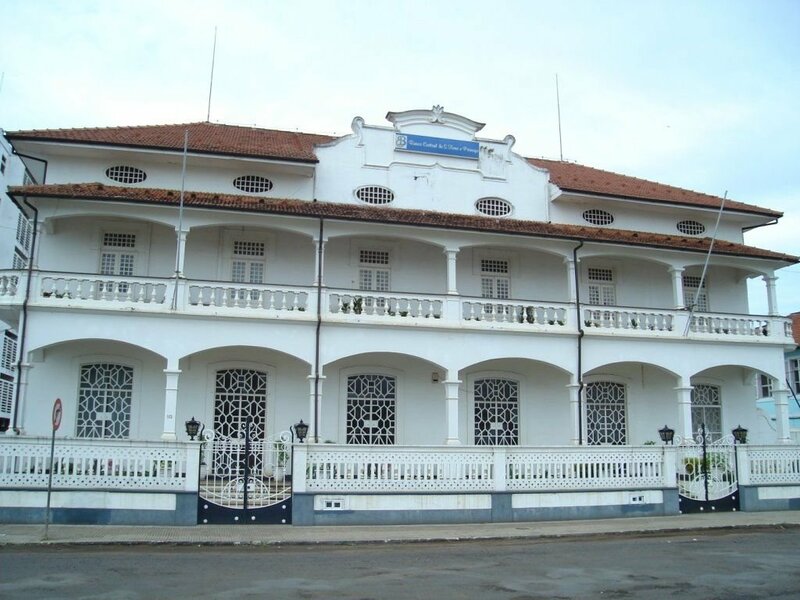 On December 2, 1914, the head of the Sao Tome branch sent a letter with the first warning about the insufficient conditions of the bank building. 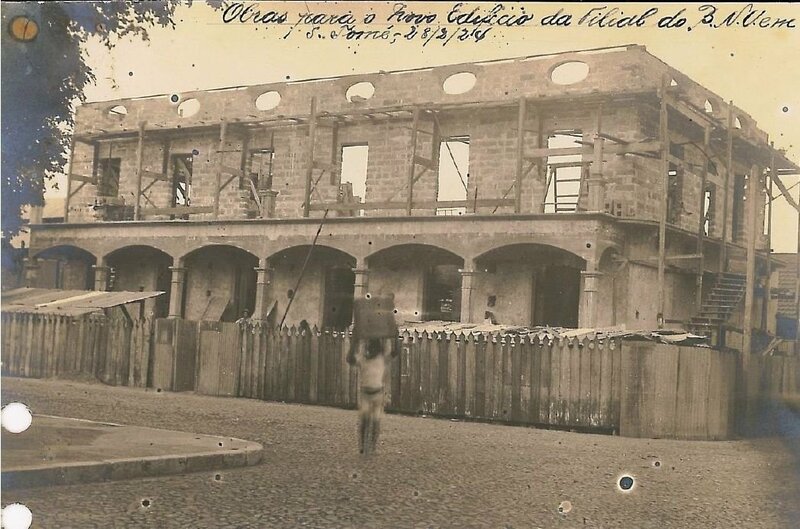 With knowledge of the plans of the municipal administrative commission of Sao Tome, the BNU was informed, on June 18, 1915, by several city sources, that a part of the bank building, on Rua Elias Garcia Street, would be expropriated in 1916. To avoid any inconvenience, the bank engaged in the acquisition of land for the construction of a new building. To this end, on January 9, 1919, in Lisbon, an act of sale of property was drawn up with a land registration number of 354, in the city of San Tome. The previous owner, Norbert Gomez Roberto, sold the property of BNU. This property included the side streets of General Calheyros on 5 October; the block of buildings was completed by the aforementioned Elias Garcia Street, where the BNU had a gate to the courtyard of the building. With this purchase BNU became the owner of the entire unit. This block then became the new branch of the Banco Central. 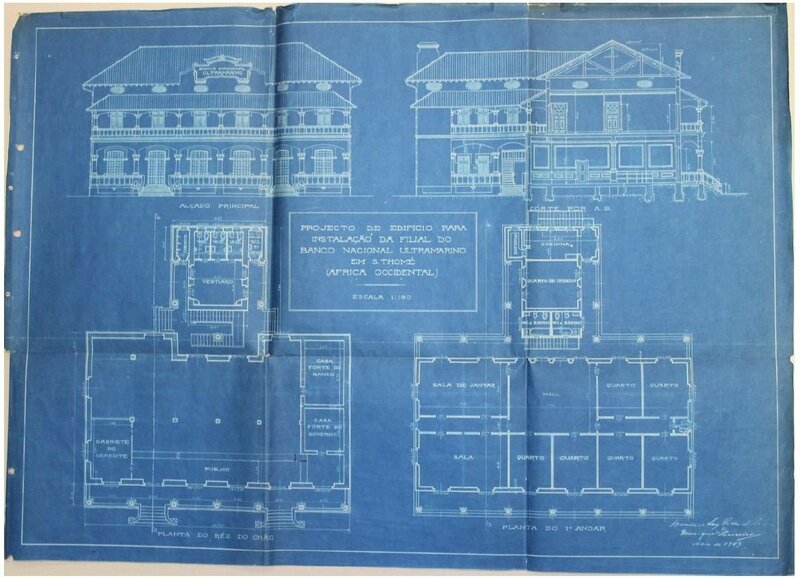 The official bulletin of the province of Sao Tome, dated March 11, 1920, published a construction project that traced the lines of this future building. 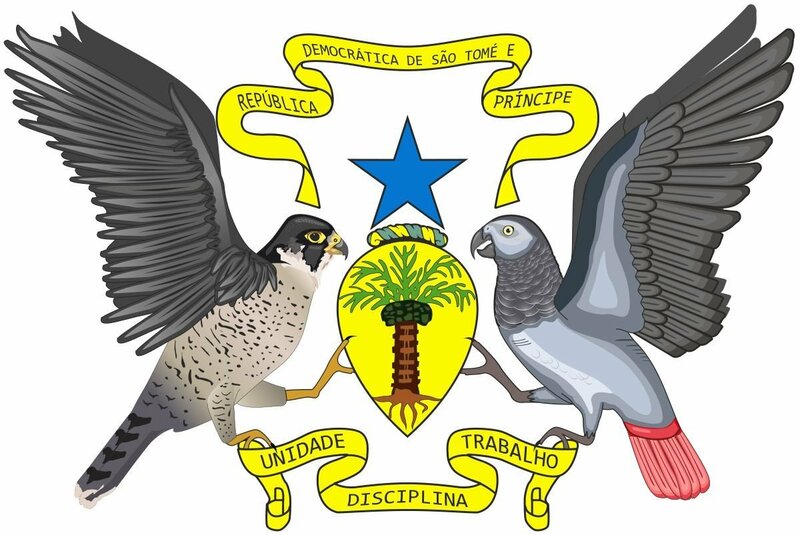 On July 6, 1923, a contract was concluded between the Belarusian National University and the work manager, José Galinha, who was immediately sent to build a new bank in Sao Tome. The BNU branch in S. Tome regularly sent, in Lisbon, reports on the work done. The beginning of the construction work took place on August 8, 1923, by José Galinha and a team of employees consisting exclusively of local residents of the archipelago. It was decided to demolish the existing buildings to make room for new construction. The demolition was completed on August 17th and the first stone was laid on the 24th. On January 10, 1924, the BNU administration decided to build two warehouses in the backyard of the bank’s section, with entrances facing side streets: General Kalheyros Street and Rua 5 de Autubro (October 5). It should be noted that almost all construction material had to be imported, mainly from factories located in Portugal. In November 1924, the question of a balcony on the first floor was considered. For reasons of cost savings, a cement construction was chosen instead of reinforced concrete. Construction work was completed in November 1925. The total area of ​​the building was 1,423.75 sq. m. - this size includes the area of ​​the building acquired from the owner of Norberto Gomez Roberto and the area of ​​the previous branch building, without part, on Rua Elias Garcia, which was expropriated by the municipality of S. Tome. The main facade of the building was located by the facade to the Republic Square. There was also an iron gate, closing public access to two doors that led to the branch’s public room. 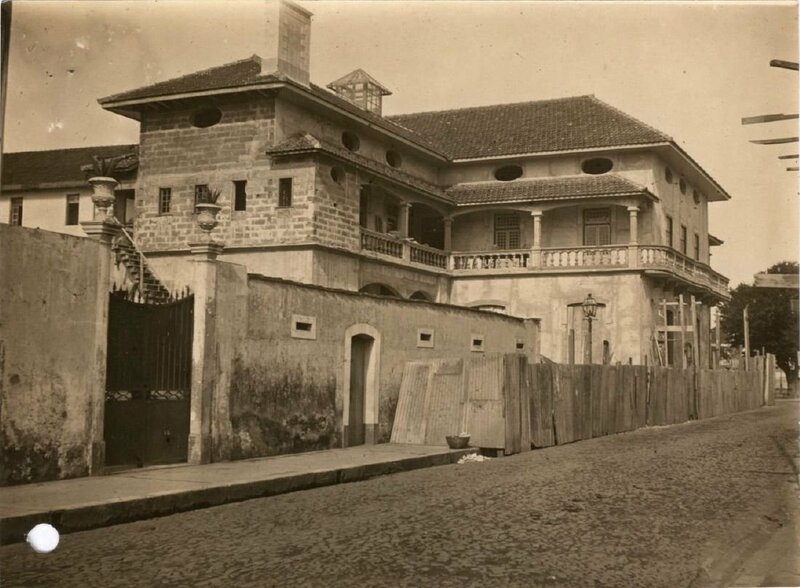 There were also two side entrances: one across General Calheiros Street and another on October 5th Street, which were intended for employees and for access to the residence of the governor, respectively. The new building consisted of two floors, with the first floor being used to service the bank, and the second floor as the residence of the governor of the bank. On the main floor there were three compartments with a central building and two extended wings to the first building. In these two wings were toilet rooms with sinks and a dressing room. In the central building there was a bank office, a manager’s office and support offices (a bank and a government); besides, there was a public service room near the entrance. living room, 6 bedrooms, another living and dining room, 2 toilets, kitchen, pantry and maid room. This floor was all surrounded by a cement porch. Access to this floor was through a cement staircase, reinforced inside with iron rods, connecting the central building and the upper floors. Another access was through a staircase in the back of the facade, which went directly to the kitchen. The official opening for the public took place on December 2, 1925. October 7, 1925 began the construction of warehouses, near the same building. For this reason, the straya construction was demolished at this place. The project was built by an engineer Leitao (Poças Leitão). José Galinha remained responsible for this work, given the good relationship between him and the bank’s management. Warehouses were completed in June 1926. In October 1928, the BNU administration allowed a small restructuring of the branch building, with interference from doors, windows, roofs, walls of some units. In November 1929, with the arrival of public lighting in the city of S. Tome, BNU continued the installation of electricity in the branch building. On October 10, 1952, the municipal council of S. Tome turned to the Bank authorities with a proposal to build a two-story warehouse, instead of warehouses, owned by the bank, in the back of the branch building, since they were not included in the urbanization plan for the area. Accordingly, the plan and budget were drawn up by the designer of public works, Antonio José Sampedro, who delivered them to the BNU on November 22, 1952. April 4, 1953 approved the plan. The project was also transferred to the administration. This new design was designed to house two archives and two garages on the main floor, while on the first floor there will be two residences and two offices. However, on September 20, 1956, given the delay in the approval of the project by the municipality, that is, the municipality’s notes on the necessary project changes, on the basis of the omission from the municipality and in order to save the cost budgeted for the vertical increase, BNU ultimately refused such a warehouse design, and it was built only on one floor. In January 1960, three lightning rods of the Franklim brand were installed on the facade of the bank branch. This was due to the fact that the building also housed a government organization, on which the defense of the BNU building depended on frequent thunderstorms on the island. On January 31, 1963, BNU acquired the property of the company Elias López Rodriguez, Lda., Located in the block adjacent to the building of the Sao Tome branch. It covered the area of ​​streets of General Calheyros, Anibal Gama, Portugal Square and the embankment of Ana Chavez Bay. In September 1965, the contractor Joachim Maria Vieira built the site. The ultimate goal of this purchase was the construction of housing for bank workers. On December 9, 1964, a branch in S. Tome requested improvements and expansion of the space where the bank branch was working in one of the back warehouses. These works were performed by contractor José Correia (José Correia), who was authorized by the Works Department on January 13, 1966. The permit was due to a misinterpretation, as in the central services in Lisbon, it was confused with the abandoned project of 1952. On January 16, 1974, at the request of the BNU administration, the management of the branch in S. Tome was informed of the need for some reconstruction. These changes were associated with internal improvements, such as - modification of the levels of protection in the treasury, an increase in the capacity of the safe. All this was due to an increase in the volume of business. These changes were not used, since with the change of the political regime, on April 25, all investments for the colony were stopped. From the day of his inauguration, in 1925 and until 1974, concrete improvement and maintenance work was carried out in the building.